Endari™ (L-glutamine oral powder) recently (July 7, 2017) received FDA approval as the first new medicine to treat sickle cell disease (SCD) in 20 years. Endari has been shown to decrease the number of sickle cell crises and hospitalizations in patients with sickle cell disease. Doctors expect it to be available for patients in the late fall of 2017. Sickle cell disease affects millions of people worldwide. People with African, Spanish, Mediterranean and Indian ancestry are at increased risk. Approximately 120,000 infants are born with sickle cell disease every year. In the U.S., approximately one in 500 African Americans and one in 1,200 Hispanic Americans are born with sickle cell disease. Approximately two million Americans — including about eight-to-12 percent of the African American population — are carriers of the disease. Carriers of the disease are said to have the “sickle cell trait.” What exactly is SCD and what causes it? 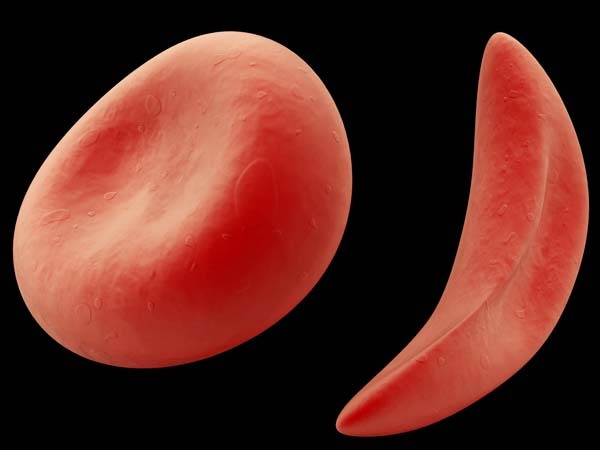 “Sickle” red blood cells are curved like the farm tool of the same name. SCD is an inherited condition where the proteins that carry oxygen (hemoglobin) are defective. These defective proteins change the shape of red blood cells from the normal round shape to an odd “sickle” shape. The job of red blood cells is to carry oxygen throughout the body so that the body can function at its best. Normally, red blood cells flow smoothly through blood vessels. Without oxygen, the red blood cells form the odd sickle shape and clump and block blood vessels and the tissues downstream are damaged. Signs of blockage, known as a “sickle cell crisis,” include excruciating pain, anemia, skin ulcers, excruciating organ damage, stroke, lung complications, and a syndrome known as “acute chest syndrome” (ACS), which may be potentially fatal and is the leading cause of death among people with SCD. Because sickle cell disease is inherited (given from parent to child), an affected person has to get one defective sickle cell gene from each of their parents. If a person only has one sickle cell gene, they are said to be a “carrier” and do not have the disease or effects of the disease, except in very rare, extreme cases. As a carrier, you can pass the gene on to your children. When both parents possess the sickle cell trait, each pregnancy has the following odds: a 25 percent chance of producing a child with sickle cell disease; a 25 percent chance of producing a child with neither sickle cell trait nor sickle cell disease; and a 50 percent chance of producing a child with sickle cell trait. When only one parent has SCD, and the other has the sickle cell trait, each pregnancy has a 50 percent chance of producing a child who has either the sickle cell trait or sickle cell disease. How is SCD diagnosed? A simple blood test can show whether a person has sickle cell disease. Most states test for sickle cell disease before infants go home from the hospital. Doctors cannot predict which symptoms a child born with sickle cell disease will have, when they will start, or how serious they will be. There are three sub-types of sickle cell disease with similar clinical pictures. Can SCD be prevented? One can avoid or minimize the effects of the disease by avoiding situations that can exacerbate the disease such as high altitude, increased atmospheric pressure, low oxygen situations, cigarette smoke exposure, severe dehydration and extreme exercise. How is SCD treated? Patients with sickle cell disease will have a lifelong struggle fighting many associated health problems such as pain, skin ulcers, infections, anemia, organ problems and stroke. Nevertheless, many patients can have an excellent quality of life by learning to appropriately care for themselves and effectively manage the disease. The best treatment is to prevent the attacks associated with the disease as outlined above. Early treatment includes daily antibiotics from ages two months to five years to prevent infections. Immunizations are also very important. Many doctors will develop a pain management plan for their patients with the disease. Sometimes, periodic blood transfusions are helpful to reduce the risk of stroke and treat the symptoms of anemia (feeling weak and tired). A bone marrow transplant may also be an effective treatment in certain patients. The most important thing a person with sickle cell disease can do is make sure they are receiving regular medical examinations with a physician who is an expert in treating the disease. The good news As mentioned above, the drug Endari has recently received FDA approval as the first new medicine to treat SCD in 20 years. Endari has demonstrated its ability to reduce the most severe complications of sickle cell disease (SCD) in both adults and children age five and older. The FDA notes that some common side effects of Endari include nausea, constipation, headache, stomach pain, cough and body pain. Endari works by reducing stress damage to red blood cells, which also reduces the formation of sickled blood cell shapes. Significantly, it is only the second FDA-approved drug to treat SCD, a serious and debilitating disease, and is now the first treatment available for the pediatric population. Action steps for anyone with SCD Talk to your doctor about the new medication, Endari™ (L-glutamine oral powder). Ask if it is appropriate for you.Learn what sets off painful events, such as dehydration, extreme exercise, cold exposure, long plane flights, high altitudes, and cigarettes. Take antibiotics as instructed. Maintain a complete immunization schedule. If you have a child with sickle cell disease, make sure caregivers and teachers know of their special requirements, including frequent drinks and bathroom trips and avoiding overexertion and cold temperatures. Locate a good support group near you or via the internet to reduce the familial stress the disease may cause. Develop a good working relationship with a physician who is comfortable and good at managing the condition. Develop a pain management plan with your doctor. Previous Previous post: Want to prevent illness and disease? Wash your hands!